Besides good leaf tea, the water quality, right water temperature, and the proper brewing time are essential for a flavourful cup of tea. Different types of tea require different brewing temperature. Tea is 99% water and therefore the choice of water has an immense impact on the smell, appearance and taste of the tea. The softer the water the better. 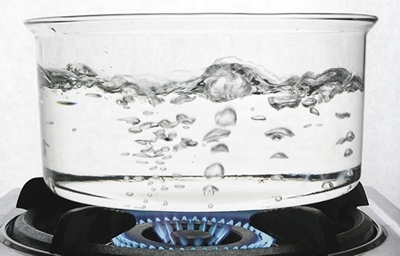 In areas with hard water use filtered water or bottled water for best results (spring water with low sodium content). If you are serious about your tea invest in a temperature controlled kettle. Otherwise the bubbles occurring in the heating process of water can be used as a temperature guideline. When you see strings of tiny bubbles rising to the surface the water has the right temperature for green/white teas (70°-80°C). Once the bubbles reach about pearl size the water is ready for Oolong and Pu Erh teas (about 90°C). From here it is only a very short period until the water starts boiling and has the right temperature for black tea (see image). Never over boil the water! It should not boil for longer then 5 seconds as it will boil away the flavour releasing oxygen and result in a flat tasting tea. For best results stop the boiling process as soon as the first big bubbles appear. In a kettle with lid it takes about 3 minutes for one litre of water to cool down to 90°C and about 10-15 minutes to reach 80°C. Every tea has an optimal steeping time. Anything outside the suggested time frame will either be under brewed with no body or over brewed and possibly bitter. Strength comes from the amount of tea leaves brewed not the steeping time! To a small extend the brewing time can also be used to regulate the amount of caffeine in the tea. Unlike coffee the caffeine in tea is combined with polyphenols which inhibit the absorption of more caffeine. Since the polyphenols dissolve more slowly than the caffeine the tea in the first three minutes has a more stimulating effect than after 3-5 minutes when the polyphenols are fully dissolved. The effect is small but noticeable so you can “wash” the tea (pour out the 1. infusion after 20-30 seconds) and the 2. infusion will be slightly less caffeinated. 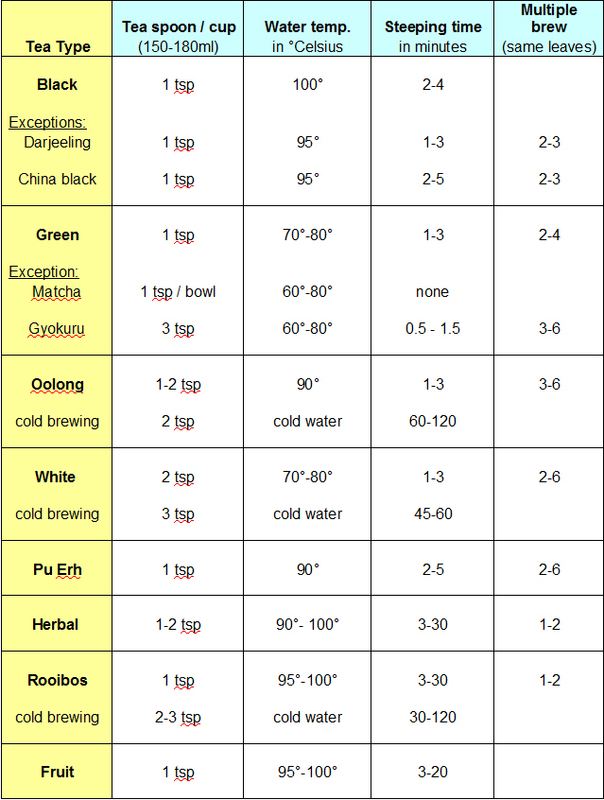 Green, Oolong, Pu Erh and some black teas can/should be brewed more than once (up to 9x for some teas). These tea leaves are designed for multiple infusions. This allows the leaves to unfold completely and release their full potential. Every infusion will taste slightly differently and contributes to an unique tea experience. For multiple brewing, make the tea as instructed but drain the tea / take out strainer after the brewing time (30 seconds- 2 minutes). It is important that the leaves do not stew. Pour fresh hot water over the leaves and you have a second, third, fourth… delicious brew. A more convenient (= lazy) approach is to simply refill the pot whenever a refill is necessary until the leaves are exhausted. Start with a preheated pot or cup if possible. Use only fresh cold water. Do not use water from the hot water tap. Let the water run for a few seconds until it is quite cold, this ensures that the water is aerated (full of oxygen). In areas with poor tap water (hard, coloured water, poor taste etc. ), use bottled or filtered water. Use about 2g of tea (usually one tea spoon) for one normal sized cup. Be aware that teas differs in volume so some teas require two spoons for one cup (see label of each tea). Tea leaves can be brewed directly in the pot/mug or with the help of an infuser or strainer. Make sure that the leaves have enough space to unfold in order to release their full potential. Bring water to the required temperature and pour the water over the leaves. Let the leaves infuse for the suggested time (use egg timer or oven timer). After use only rinse the tea pot with clear hot water, not with detergent. Tea should be stored in an airtight container in a dry and dark place. Do not store with other strong smelling food, e.g. coffee, herbs, spices etc. since tea will absorb the stronger smell and loose its taste. 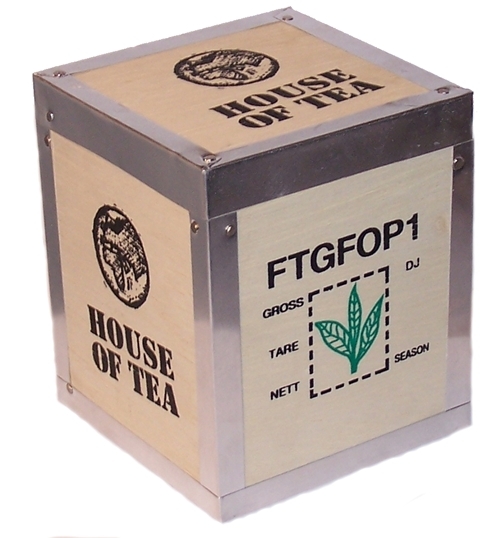 In a suitable environment the tea will stay fresh for about 6 – 18 months, depending on the type of tea. Oxidised/fermented teas like black or Pu Erh will last longer than the un-oxidised categories (i.e. green and white). Other teas like Herbal, Rooibos and Fruit should not be stored for longer than one year. Except for Pu Erh the rule of thumb is the sooner you use the tea the fresher it will be.